The EMSCULPT is the only procedure to help both women and men build muscle and sculpt their body. In addition, the EMSCULPT creates the world’s first non-invasive buttock toning procedure. EMSCULPT contracts muscles beyond what is possible through physical training, yielding better muscle tone and enhanced fat metabolism. A single EMSCULPT treatment is the equivalent of doing approximately 20,000 sit ups or squats. This muscle contraction leads to building of new muscle mass (increased tone and muscle definition) as well as enhanced fat metabolism through lipolysis, or destruction of fat cells. EMSCULPT burns fat and tones muscle in the abdominal and buttocks region without pain, downtime or sweating it out at the gym. The non-invasive HIFEM® (High-Intensity Focused Electromagnetic) technology induces powerful muscle contractions not achievable through voluntary contractions. When exposed to strong contractions, the muscle tissue is forced to adapt to such extreme condition. It responds with a deep remodeling of its inner structure that results in muscle building and sculpting your body. How Many EMSCULPT Treatments are Needed? Clinical studies with EMSCULPT for the abdomen and buttocks treated patients for 30 minutes, twice a week for 2 weeks, a total of 4 treatments. Typically, one treatment every 3-6 months for maintenance is required to maintain results, . Who is a Good Candidate for EMSCULPT? Adults in good shape who desire more definition of their abs or lifting of the buttocks are ideal candidates for EMSCULPT. EMSCULPT is well-suited for those who workout but just can’t seem to get a six-pack or a perky derriere. Good candidates are already physically active and adhere to a healthy diet and lifestyle. What Areas of the Body Can be Treated with EMSCULPT? EMSCULPT is FDA-cleared for the abdomen and buttocks. However, other areas of the body may benefit from increased muscle tone and fat metabolism. What does EMSCULPT feel like? 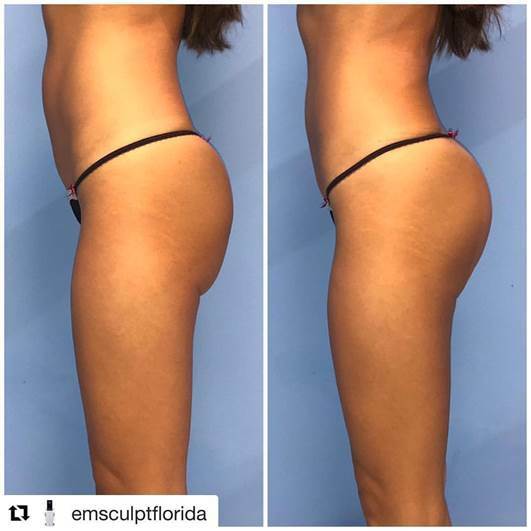 Does EMSCULPT hurt? EMSCULPT is not painful, it simply feels like a series of strong muscle contractions. Thinner patients may feel EMSCULPT more, and decreased energies may be used during treatment. Many patients tend to instinctively smile or laugh during the first few minutes, then the body adapts to the rhythm of muscle contractions and it’s easily tolerated.